Up To My Neck In A Hex is the second single to be taken from The Penny Black Remedy’s latest album, Inhale… Exhale… OK, Now You Can Panic!. The digital-only single – coupled with Self-Help For The Hopelessly Optimistic - is due for release on Monday 28 October and will be accompanied by a new video, directed by Gary Sobczyk. Both tracks will be available to download free of charge from the band's website from Monday 21 to Sunday 27 October. The song is a personal account of writer Keith M Thomson’s readiness to escape from his psychologically restrictive beliefs in, adherence to and the subsequent vicious cycles of age-old superstitions, curses and plain bad luck. It alludes to a constant internal battle between self-determined destiny and pre-determined destiny and reflects nostalgically upon a time when it was simply more practical to live life as a stone-hearted cynic. The song ultimately acknowledges the futility and irrationality of living life strictly in accordance to a series of random occurrences and mercifully sees Keith take his first few positive steps to breaking out of a grudgingly self-imposed psychological prison sentence. 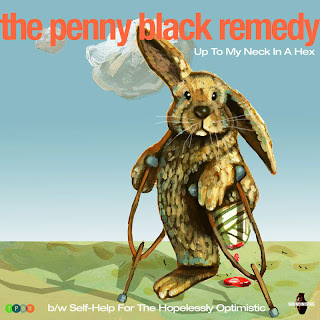 With their high octane live sets and unique musical fusion of Americana, Punk, Folk and Ska, The Penny Black Remedy have been thrilling crowds across the UK and the rest of Europe since the band’s inception in London in 2007. Their live performances, as forceful as party political campaign rallies, but unlike those - honest to the core, have seen them build a fiercely loyal following, many of whom happily brave many miles and borders to see them. Songwriter Keith M Thomson’s fine blend of darkly humorous lyrics and joyful life affirming melodies have enticed diverse, international, audiences to fully engage in their distinctively interactive shows by enthusiastically singing-along to every word. Some of these songs can be found on their album, ‘No One’s Fault But Your Own’ (released on their own independent label, Soundinistas, and globally distributed by Cadiz Music). Joining Thomson in his colourful and culturally diverse collective are Croatian vocalist Marijana Hajdarhodzic, and Dutch drummer Wilco van Eijk. Keith, Marijana and Wilco were proud to recently welcome UK Subs and Flying Padovanis legend Paul Slack on bass duties. Since last year, TPBR have on occasion been joined on stage by exceedingly energetic and equally charismatic brass section, The Horns of Fury. The Penny Black Remedy’s highlights so far have included sharing bills with bands such as the Buzzcocks and Fishbone, being voted by the audience in the ‘top 3 best acts’ at Larmer Tree Festival, and playing festival scene few years running (Glastonbury, The Secret Garden Party, Bestival, Larmer Tree), The Guardian’ Robin Denselow stating that the song ‘I Won't Argue When I'm Dead’ is "Quite simply, the finest country sing-along I've heard on the vexed pop topic of how one's body should be disposed of after death”.